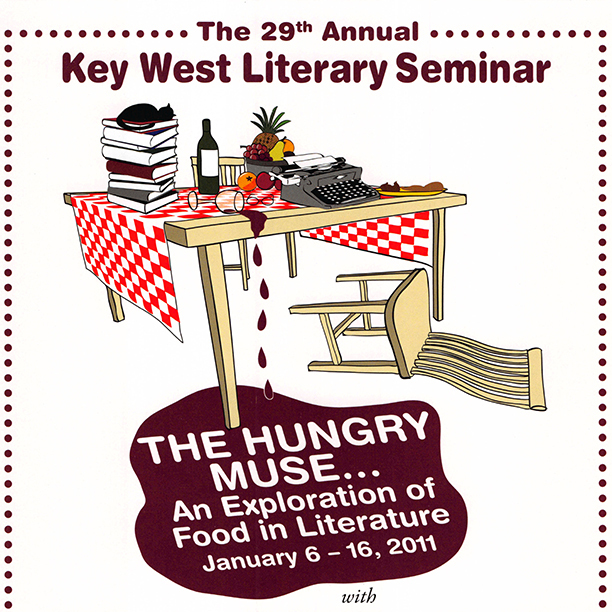 Coverage of the 2011 Seminar: "The Hungry Muse"
Presenters: Diana Abu-Jaber, Elizabeth Berg, Roy Blount Jr., Frank Bruni, Kate Christensen, Billy Collins, John T. Edge, Jason Epstein, Jonathan Gold, Darra Goldstein, Adam Gopnik, Gael Greene, Jane Hirshfield, Madhur Jaffrey, Judith Jones, Mark Kurlansky, David Mas Masumoto, Harry Mathews, Nicole Mones, Bich Minh Nguyen, Molly O’Neill, Julia Reed, Ruth Reichl, Michael Ruhlman, Patrick Symmes, Calvin Trillin, and Kevin Young. Writers’ Workshop Faculty: Paulette Bates Alden, Alan Cheuse, Billy Collins, Jane Hirshfield, Connie Regan-Blake, Porter Shreve, Susan Shreve, Robert Stone, Dara Wier, and Hilma Wolitzer. The stage setup for the 29th Annual KWLS, The Hungry Muse. Photo by Nick Doll. The crowd during the 29th Annual KWLS. Photo by Nick Doll. Roy Blount Jr. during his reading, "Voices Around The Table: The Way Folks Were Meant to Eat". Photo by Nick Doll. Molly O'Neill and Calvin Trillin during a coffee break. Photo by Curt Richter. "Hunger is the Best Sauce: My Month on the Cuban Food Ration", a reading with Patrick Symmes. Photo by Nick Doll. The crowd during "Hunger is the Best Sauce: My Month on the Cuban Food Ration" with Patrick Symmes. Photo by Nick Doll. Stage setup between panels at the 29th Annual KWLS, The Hungry Muse. Photo by Nick Doll. The audience before a panel at the 29th Annual KWLS. Photo by Nick Doll. The 29th Annual KWLS at the San Carlos Institute. Photo by Nick Doll. "How We Write about Food: Obsessions with Food and Writing" with writers (L-R) Kate Christensen, Michael Ruhlman, Adam Gopnik, Bich Minh Nguyen and Molly O'Neill. Photo by Nick Doll. (L-R) Writers Kate Christensen, Michael Ruhlman, Adam Gopnik, Bich Minh Nguyen and Molly O'Neill. Photo by Nick Doll. Author Calvin Trillin. Photo by Curt Richter. (L-R) John T. Edge, Billy Collins, Michael Ruhlman and Molly O'Neill during their book signing. Photo by Nick Doll. A book signing with author Adam Gopnik and poet Jane Hirshfield. Photo by Nick Doll. Poet Laureate Billy Collins during his reading "Thanksgiving in January: Poems About Food". Photo by Nick Doll. "Beyond Personal History: The Art of Writing a Life in Food" with Gael Greene, Bich Minh Nguyen and Madhur Jaffrey. Photo by Nick Doll. Poet Jane Hirshfield with writer David Mas Masumoto. Photo by Curt Richter. The panel "Passionate about our Fruits & Vegetables: In Praise of Food Culture" with (L-R) David Mas Masumoto, John T. Edge, Molly O'Neill and Michael Ruhlman. Photo by Nick Doll. Books for sale at the 29th Annual KWLS. Photo by Curt Richter. Calvin Trillin and Roy Blount Jr. during The John Malcolm Brinnin Memorial Event, "Foodwords: The Language of Eats". Photo by Curt Richter. Author Roy Blount Jr. talks with a seminar attendee during his book signing. Photo by Nick Doll. A book signing with Calvin Trillin, Billy Collins, Molly O'Neill and Madhur Jaffrey. Photo by Curt Richter. Author Calvin Trillin with Poet Laureate Billy Collins at their book signing. Photo by Curt Richter. KWLS board member James Gleick with writer Laurent de Brunhoff and his wife, literary critic Phyllis Rose. Photo by Curt Richter. Refreshments offered during a reception at the 29th Annual KWLS. Photo by Curt Richter. The registration table at the 29th Annual KWLS. Photo by Michael Blades. Author Gael Greene signs a book for David Wolkowsky. Photo by Michael Blades. David Mas Masumoto during his reading, "How I Lost My Food Virginity". Photo by Michael Blades. Authors Roy Blount Jr. and Calvin Trillin. Photo by Michael Blades. Kevin Young during his panel, "I Want to Be Doused in Cheese and Fried". Photo by Michael Blades. "Hungry For The Muse" with Judith Jones, Diana Abu-Jaber, Julia Reed and Madhur Jaffrey. Photo by Michael Blades. Senior Editor and Vice President of Alfred A. Knopf, author Judith Jones. Photo by Michael Blades. 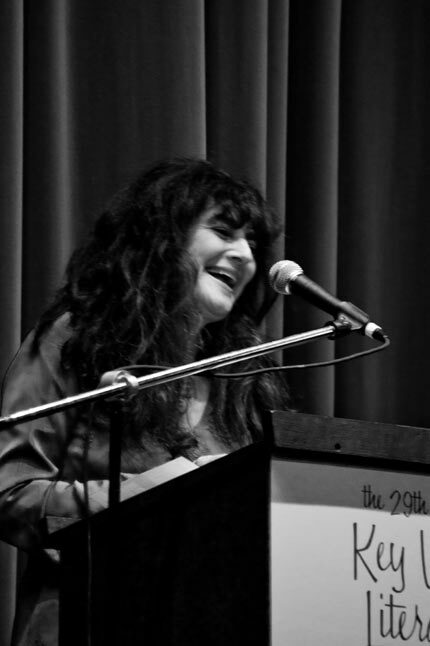 The panel "The Saucy Pen" with Ruth Reichl and Diana Abu-Jaber. Photo by Michael Blades. Author DIana Abu-Jaber signs a book for a seminar attendee. Photo by Michael Blades. "Drinking and Other Southern Pursuits" with author Julia Reed. Photo by Michael Blades. "The Art and Craft of Restaurant Criticism" with Ruth Reichl, Jonathan Gold and Frank Bruni. Photo by Michael Blades. "The Epicurean Balancing Act" a reading with Frank Bruni. Photo by Michael Blades. "Homage To Our Forebears" with Judith Jones, Jonathan Gold and Molly O'Neill. Photo by Michael Blades. "I've Come to Look For America" a reading with Molly O'Neill. Photo by Michael Blades. "Whatever Happened to Chicken à la King?" with Calvin Trillin and Roy Blount Jr. Photo by Michael Blades. Author Madhur Jaffrey. Photo by Michael Blades. KWLS board member and author Judy Blume introduces scholarship winners. Photo by Michael Blades. 2011 winners of Named Scholarships: Kim Adrian, George Kamide and Brynn Saito. Photo by Michael Blades. Scholarship winner Kim Adrian. Photo by Michael Blades. 2011 scholarship winner Brynn Saito. Photo by Michael Blades. 2011 scholarship winner George Kamide. Photo by Michael Blades. KWLS board member Judy Blume poses with 2011 scholarship winners. Photo by Michael Blades. What Ever Happened to Chicken à la King? Calvin Trillin, Roy Blount Jr.
Frank Bruni, Julia Reed, Roy Blount Jr.
Billy Collins, Harry Mathews, Roy Blount Jr.
Billy Collins, Jane Hirshfield, Kevin Young, Roy Blount Jr.